This has already been said, but you really do need all 4 Wrench Mind s. I'd cut Liliana's Triumph for them, especially since you only have 4 Lilis in the deck. Shouldn't Wrench Mind be some kind of discard that shows you their hand to help Cabal Therapist ? 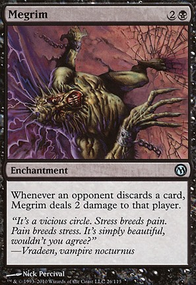 I think it's risky to go down on discard spells by much, it allows the opponent room to play around your Racks and Afflictions. 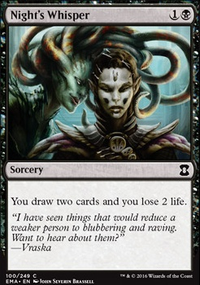 I would suggest cutting Liliana's Caress and Skewer the Critics in favor of Smallpox and Wrench Mind . 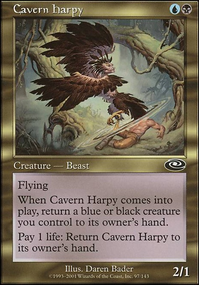 I've also had great results with Raven's Crime which lets me play 23 lands and a really low curve, and rather than flooding out I stay on top of my Smallpoxes and keep retracing with any extra lands. I think Raven's Crime would be an upgrade from Dark Deal . And I think if you keep Liliana's Caress for the full 12 racks, then you might not even want the Bolts. I thoroughly enjoy this deck, I like the discard factor. I do think it is a little land heavy for what you want to run. Perhaps take some out for more discard goodies such as Waste Not or maybe Wrench Mind . I think Waste Not is a good addition because it adds more value to your discard theme. Wrench Mind is a win-win for you anyway because they have to discard at least one card, if not two, causing a double trigger for your deck. Darth_Savage I think Reforge the Soul would be an amazing addition here. I overlooked it because I only looked for cards with lower mana costs, I didn't even consider there can be a Miracle card that's suitable for my deck, thanks! 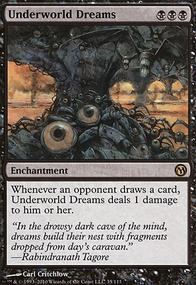 A very early version of this deck did feature cards like Whispers of Emrakul and Wrench Mind, but in the end these discards were not potent enough- Dark Deal or Reforge the Soul that you mentioned can cause a 7-card discard, and even Burning Inquiry is a 3-card discard for one mana. 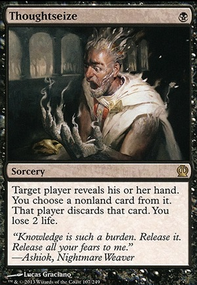 After all, my intent is not to lock my opponent out of cards, but to make them discard a lot (and thus get creatures, cards and mana from Waste Not). Gnat Miser is a no-go for the same reason. Sign in Blood might be a good addition here, it's very versatile. 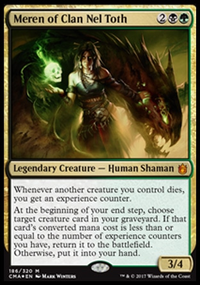 Seizan, Perverter of Truth would be even better, but it's a very costly creature- by the fifth turn an FNM game is usually over. 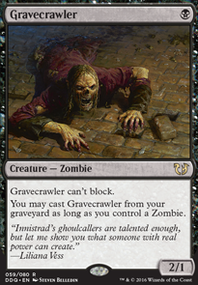 Do you maybe have any card suggestions for surviving before the combo gets activated? 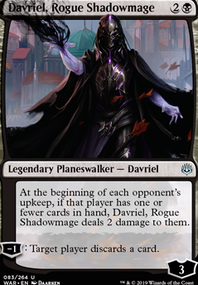 I haven't played against any control-heavy deck with it yet, even in playtests, so I'm not really sure what pieces could help. Thanks for your input!